Windy with a mix of clouds and sun. High around 65F. Winds WNW at 25 to 35 mph. Winds could occasionally gust over 50 mph..
Windy. Cloudy skies will become partly cloudy after midnight. Low 39F. Winds WNW at 20 to 30 mph. Winds could occasionally gust over 40 mph. Teegan Thurman drives in against Emily Williams at a recent Lady Warriors practice. For the Lady Warriors, there is plenty of familiarity on the 2018-19 squad, but then again, plenty has changed. This year Tehachapi returns nine players from a squad that went 13-14 last season and 3-7 in the basketball tough South Yosemite League. The additional season of maturity and experience will no doubt help the Lady Warriors who this season will be led by a new group of coaches. Taking over for Jacques Vachon is Jason Grimes, who previously coached at Jacobsen Middle School. However, Grimes is currently taking a leave of absence and Clint Cass is the interim head coach. Cass, however is the first to admit it’s former JMS assistant Jimmie Perkins calling the shots for the Warriors as the season gets underway. Perkins, who is also in his first season coaching at Tehachapi High, is already instilling the Warriors with a new sense of defense, pride and a faster way to play the game, taking advantage of a multitude of diverse weapons on the floor, especially with a team returning several key players. “They have a good chemistry built up amongst themselves already and a good knowledge of how to play with one another and play like a real team,” Perkins said. Guard play will be critical for the Lady Warriors this season and there is plenty of talent at that position led by junior point guard Irey Sandholdt, who averaged eight points and nearly five rebounds per game last season as a sophomore on the varsity squad. She’s joined by senior point guard Madylin Cotta and junior Emily Williams. All will see court time thanks to a deep Tehachapi bench. An intriguing part of this Tehachapi team is the forward position where senior Teegan Thurman returns after a stellar 2017-18 season, when she averaged 17 points and 11 rebounds per game. While listed at 6’1” Thurman not only has height, but an ability to score in a multitude of ways. “She can play the forward but has the ability to shoot like a guard or play down low,” Perkins said. Forward Evangeline Figueirdo returns for her season as well and will be looked upon for quality minutes as a wing player for Tehachapi. The Lady Warriors open their season this week with a pair of scrimmages at home against Rosamond and Quartz Hill before heading to Robert F. Kennedy in Delano on Nov. 27. After that it will be a healthy dose of holiday tournaments in the area before opening SYL play on Jan. 9 at Bakersfield Christian. 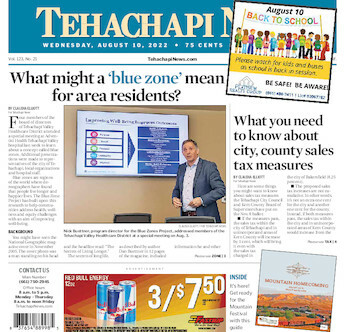 The first few games for Tehachapi will provide the opportunity for Perkins to sort through his rotation and figure out which players to have on the court in each game situation.